Having made a list of things that need doing in my last post here I can now start ticking them off again. Since I last posted, I've fitted the new aerials on the roof with only a minor issue caused by discovering that the fibreglass roof is so thick in places that there was hardly enough thread on the fittings to reach through. Not what you want to discover just after drilling a half inch hole in the roof! Fortunately there was just enough thread and they all went well. A trip to Maplin got me the necessary cable and connectors so I'll see about getting those fitted this weekend. To try and work out whether it was sensible to weld the new air suspension brackets in place I bolted one of them to a piece of wood with the same dimensions as the chassis rail. I was still able to attach the air spring to the bracket afterwards so it looks like welding the brackets to the chassis will leave enough clearance to fit the springs. The only alternative I had come up with was to bolt the brackets on with a fitting that passed right through the chassis and floor pan to the inside of the vehicle. That would put the fitting directly underneath the rear seat mounting though so could get complicated. I think that simply welding on the brackets is the way to go. Since the weather was actually quite good last weekend, the rear door seals finally dried out and I was able to attack them with the RTV sealant again. At the moment I seem to have cured the leak but I've said that before so I'm not holding my breath! Fingers crossed that one is finally sorted as well. Someone decided to steal the spare wheel from my trailer last week and also broke a door handle on it at the same time. Annoying but replacement parts have been ordered from the manufacturer. I'm hoping they arrive in the next week or so as I've agreed to help Martin get his TR7 rally car to its first event in two weekends time. The trailer is usable as it is but I don't like travelling without a spare wheel. I've discovered some other minor damage caused by the garage working on the van a couple of weeks ago. Now I've been able to have a closer look, I'm not particularly happy with the quality of the work that's been done, especially given how much I paid for it. Oh well. Something else to put down to experience I suppose. 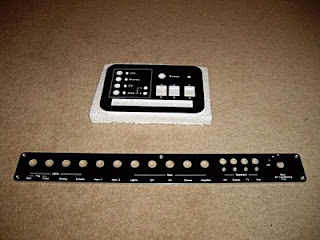 I've been cheered up however by the arrival of my new custom made control panels all the way from Germany. There's something a bit special about designing something and then getting it made professionally. These were a little expensive but will provide a professional finish that I don't think could have been achieved any other way. Very pleased. I'm gradually building these up with the necessary switches and connectors. I'll try and remember to post another picture when they're complete. Panels look really good, which company did make them for you? I got the panels from http://www.schaeffer-ag.de/. They provide a basic CAD package, you design your panel with it and they make it. Whenever she’s out in the neighbourhood or on the red carpet, ted baker outlet the former Destiny’s Child is always dressed to impress. To mimic this Beyonce fashion evolution (every stiletto-clad step of the way), I found a blazer from Cotton On for Dh99, high-heeled shoes from cheap ted baker dresses Steve Madden for Dh245 (was Dh329) in the closest colour I could find, black shorts from Tati for Dh20 (was Dh66), white top from Berskha for Dh30 and Just Cavali sunglasses from Polaristed baker dresses sale (Mercato) at 50 per cent off the price for Dh650.